Dawes County Journal: No cell phones? Kids had "Time on Their Hands"
No cell phones? 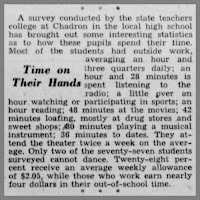 Kids had "Time on Their Hands"
On a winter day back in 1947, the Lincoln Journal-Star published a story about how high school students in Chadron were spending their time. The report was based a survey of 77 high school students and was conducted by Chadron State Teachers College. We don't know if the kids were from Chadron Prep, Assumption Academy, Chadron High – or all of those schools. It wasn't front page news, but the page 6 story offered some interesting contrasts with today's young people – most of whom are attached to a smart phone or some other "social media" device. 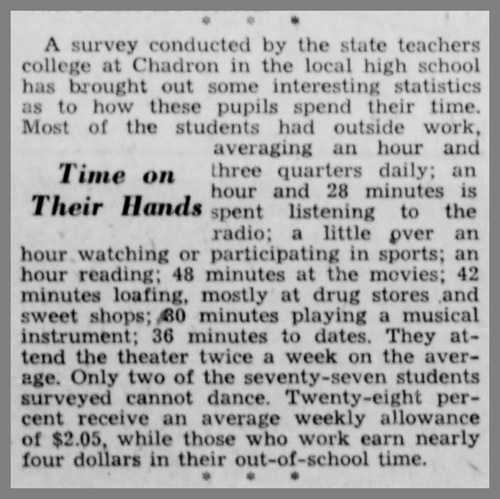 "A survey conducted by the state teachers college at Chadron in the local high school has brought out some interesting statistics as to how these pupils spend their time. Most of the students had outside work, averaging an hour and three quarters daily; an hour and 28 minutes is spent listening to the radio; a little over an hour watching or participating in sports; an hour reading; 48 minutes playing a musical instrument; 36 minutes on dates. They attend the theater twice a week on the average. Only two of the seventy-seven students surveyed cannot dance. Twenty-eight percent receive an average weekly allowance of $2.05, while those who work earn nearly four dollars in their out-of-school time." It would be interesting to compare those findings with contemporary data. We'd hazard a guess that only two of seventy-seven students surveyed today CAN dance. We're also inclined to think that kids aren't reading books much these days. Although we suspect they do spend more than an hour reading – but it's top-heavy with short bursts of items from Facebook and other social media. And 70 years ago, if you asked someone if they had a cell phone, they likely would have thought you had the misguided notion they were doing time in the basement jail at the old City Hall with a pay phone at the end of the hall – not a device appended to their person nearly 24/7. Not sure which of those two scenarios is worse. ...Sigh.